The Weltmeisterschaft is over for the Germans but the Copa Mundial is still going for the Spanish. Myself, I’m hoping for a triumphant Wereldkampioenschap for the Dutch. I don’t have a big reason for supporting the Oranje other than they had the common decency to beat Uruguay after that disappointed much of Africa by putting Ghana, who in a fair world would have won, out of the tournament. 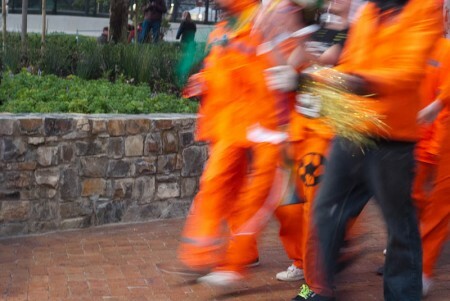 It seems that a lot of Cape Town and possibly South Africa is behind the Dutch as well. The easiest explanation is the shared language/ culture of a portion of the white population, but I’ve seen a lot of different people wearing orange, so maybe the explanation is a bit more complex. Before that match I went down to the “Fan Walk” between the stadium and the Grand Parade, a large open area across from the old City Hall where a public viewing area has been set up. It was packed. Despite the fact that the stadium only holds 64,000, the City estimated that 149,000 participated in the Fan Walk with a further 200,000 in the City Bowl. And I found that the Grand Parade (the FanFest), with a capacity of 25,000, was full almost an hour and a half before the game. 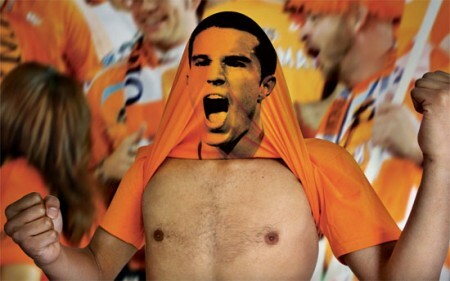 A Dutch firm designed some awesome fan T-shirts. Yeah, there’s been some anti-FIFA sentiment. It could be that they’re so powerful that even decisions by national presidents can be effectively overturned by the organization. Or it could be that they’re bringing in a boatload of money (while somehow maintaining untaxed status as a “non-profit”) while all that South Africa gets is a seratonin boost. And it seems that even that might not last. Or it might be that despite clear evidence that their officiating isn’t making the right calls they’re only going to “look into” goal line technology and refuse to believe that any other technology (like offsides, other replays) is necessary. Despite the fact that Team USA is out of the cup and have been for a while there’s been a lot of speculation that the nation might be starting to like soccer. Well-known sportswriter Bill Simmons says he’s been hearing “soccer is taking off in America” since the 1978 World Cup but now he’s ready to believe them. When Donovan scored that Cup-saving goal against those spineless playing-for-a-tie-when-they-needed-to-win-by-two-goals Algerians, the moment resonated like no other goal in American soccer history. We didn’t have anyone telling us how we should feel, what the implications were, what the moment meant. We knew what it meant. We wanted more games. We wanted our boys to keep playing. Someone scored. We celebrated. We jumped up and down. We ran around the room. We were alive for another game. For once in a fragmented sports world, we all happened to be rooting for the same thing. Soccer is no longer taking off. It’s here. Those celebratory YouTube videos that started popping up in the 24 hours after Donovan’s goal — all unfolding the same way, with a stationary shot of nervous fans watching the game in a bar, going quiet for a couple of seconds during the American counterattack, reacting to Dempsey’s miss (“Nooooooooo!”), holding their breath for two beats (“Wait a second â€¦”), exploding on Donovan’s finish (“Hi-yahhhhhhhhhhhhhhhhhhhhhhhhhhhhhh!”), then chanting “USA! USA! USA!” afterward — tapped into a collective American sports experience unlike anything since Lake Placid. There’s a cool book out called Amen by Jessica Hilltout about grassroots soccer throughout Africa. The NY Times is currently featuring some the her photos from the book. 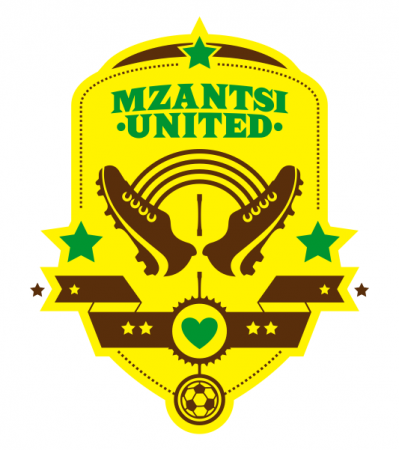 Umbro asked some local firms to design a new soccer crest. I like the results quite a bit, particularly the one by TwoShoes Design above. Msantsi (or Msansi sometimes) means “South” and is often used as a nickname for South Africa or South Africans. There have been plenty of foreign journalists in South Africa reporting on the WM. Many of the stories mention the helpfulness of South Africans or the relative lack of crime (170 cases for crimes by or against tourists). A common refrain which I’ve heard is “Where are you from? What do you think of our country?”. I think more than anything South Africans want visitors to have a good experience here and go back with a positive experience of the country. I can relate to that: I’ve asked similar questions to the visitors I’ve met and I’ve tried to do my part giving them a positive experience in whatever small ways I can. I started this back in SF and I really wanted to finish it before I came here but things got really busy before I left. Mandela is one of the most inspiring figures of modern times. Everyone focuses on the post-prison Reconciler, but seeing the young, brash, successful Mandela is interesting, as is his reasoning behind various decisions in his life (like starting the military wing of the ANC). Though not faultless, it’s well told and I’d thoroughly recommend it. I flew through this book. It’s an addicting book and I had time on my hands. I saw the ending coming from miles off and the narrators political rants get old, but I still couldn’t put it down. A book about an area of the country that I love (but hadn’t seen at that stage), the Karoo. A mix of family and regional history, plus discussions of the plants, animals and fossils of the area, it wasn’t very interesting at a time—though parts of it came back to me during trips through the area—and unless you’re intensely interested in the area, I’d give it a skip. The first book I bought in South Africa, it’s collection of new writing from Africa with 34 stories from 12 different countries. The quality is pretty hit-or-miss with the best being quite good but many boring stories are contained within as well. Read the prize winning stories in a book store and skip the rest, I’d say. As you probably know, this is a novel about a brash, subversive patient at a mental institution which has thus-far been run with an iron fist by the head nurse. It’s definitely worthwhile if you haven’t read it yet. This is the book that got turned into the movie Invictus. It’s both better researched and better presented than the movie, with both more depth and breadth about the lead-up and triumph of the 1995 Rugby World Cup in South Africa. Quite moving in the end. This is a series of essays in Klosterman’s trademark snide, often sidetracking style. I love Klosterman’s writing and I tore through this book which includes interviews, essays and general pop culture pronouncements. I might start with Killing Yourself to Live if you haven’t read anything by him, but if you like his writing already, you’ll like this. Michael Lewis is a fantastic writer. I enjoyed Moneyball and various essays he’s written for the New Yorker or Vanity Fair and I enjoyed this story of the rise of the left tackle in football and the rise of one player, Michael Oher, through life. Even if you marginally enjoy football, you might like this. Various travel stories written by the highly sarcastic British writer. He can be funny but offensive, eg. “Do you think that when the Berlin Wall came down the East Germans were disappointed that there was just more Germany on the other side?” Overall, it was pretty good. Possibly the best book I’ve written this year. 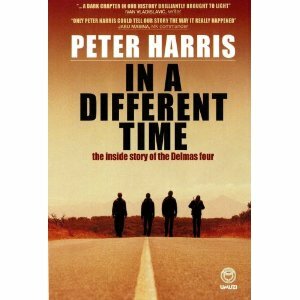 Harris was the defense attorney for many cases involving the ANC and this book chronicles the case of the Delmar Four, MK operatives who were tried for a series of crimes including assassination, bombing, etc. Very well told and very thought-provoking. My dad gave me this book about behavior economics, as some call it. Basically, in various situations, people regularly act in ways that aren’t described by classical economics. Ariely has done a lot of studies about this and found fascinating things. (Eg make something FREE! and people go nuts, or people judge such things as value of items and attractiveness of people relatively rather than absolutely.) It’s not the sort of book I normally read, but I found it very interesting. I really enjoyed Sacks’ Musicophilia so my parents got me this book (autographed, nogal!). It’s a series of case studies on a variety of neurological conditions and disorders. Sacks looks at the artist that perfectly replicates the village of his youth, which he hasn’t visited in 30 years. And the Tourettic surgeon and autistic professor. It’s more in depth about the neurology than Musicophilia which makes it a slower read but also more informative in some ways. I still liked it. I just finished this book of short (often 2-4 pages) stories by this Israel author. He uses very concise writing in his often surreal stories; he can say a lot in two pages. A lot of it is set in modern Israel so there are some pretty heavy topics within. Overall, I really liked it. I recently joined Goodreads. You can see what I books I’ve read/ am reading and whether I like them there. The SABC is broadcasting all 64 games in many different languages (at the very least: English, Afrikaans and four African languages, but I suspect five more). I love one of the English-language announcers. He speaks with a typically African accent but his enthusiasm is infectious. One of my favorite moments was during the New Zealand-Slovakia game. In the 94th minute, Slovakia was up 1 – 0. A cross… a CHANCE and…GOOOOOOAAALLL! WOW O WOW O WOW O WOW!!! THAT IS WHY THEY CALL IT THE BEAUTIFUL GAME!! THE GOAL THAT NEW ZEALAND ALWAYS HOPED AND DREAMED OF! It may not be as polished as the imported-from-England announcers that most stations are using, but I love it.